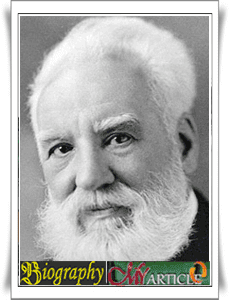 Alexander Graham Bell was an eminent scientist, inventor, engineer and innovator who invented the first telephone cal. Bell's mother and wife have trouble hearing or deaf, it is a profound impact on the lives of Bell. He did research elocution (art read or pronounce the sentence with good accent and right) and a speech that was helped by his family, there Bell experiment with hearing devices which eventually brought Bell in awarding the first US patent for the telephone in 1876. Many of the discovery of the Bell mark next life, such as the innovative work in the field of optical telecommunications, hydrofoils and aeronautics. In 1888, Bell became one of the founding members of the National Geographic Society. Bell has been described as one of the most influential figures in human history.